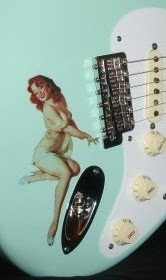 NY based Ed's Virgin Guitars currently lists this NAMM Special, Jason Smith Masterbuilt Strat. Click the images for close-ups! You're looking at a Taos Turquoise with gold leaf, finished with clear poly to prevent scavengers from scraping the leaf between sets when you go to the bathroom-- good idea! Not your usual finish, this is thematically eclectic enough to go either Egyptian, Mayan, Aztec or possibly even Hindu. I guess it all depends upon your choice of strap and/or shoes, and what scales you were practicing this week. Underneath, they call it a '65 NOS. The alder body is loaded with hand wound Fat 50's pickups and lots of gold hardware. Neck is a '65 "C" at 9.5" radius. Although we also see a bound fretboard here, they don't mention it in the specs/features?? Between this and the Taos Turquoise, I first thought that Jason pulled a fast one by modding an Eric Johnson. But the neck profile is not an EJ, it has string trees-- and the body sports a traditional heel (not contoured). So we'll just say that he was inspired by the Taos Turquoise EJ, and took it somewhere else only to be determined by strap and shoes. Notice the EVH-ish back pattern... WTF??? Comes with COA (pictured) and OHSC.